Heroic Fantasy Writers: Words with Rick Chesler author of "Wired Kingdom"
Tell us a little bit about "Wired Kingdom"
Thanks a lot for having me on your blog, Walter! 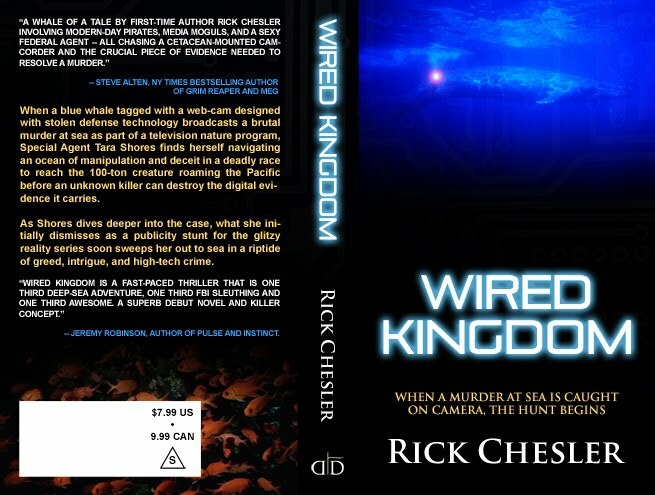 Wired Kingdom is my debut novel, about a whale tagged with a webcam that broadcasts a murder at sea. "Wired Kingdom" is set to be released on May 25th. Do you have any big plans for the launch date? I tried to put together a launch party like they did for Windows 95 with skywriting and simultaneous parties in various world capitals across 12 time zones, but that sort of fell through at the last minute. However, somewhere in America, a Wired Kingdom bookmark has been hidden in the book section of a WalMart. Find it, describe it to me and tell me where it was, and you win a free signed copy. But don’t mention anything about it to WalMart. OK seriously, I’m giving away a few signed copies, and I will be hanging around my computer all day on the 25th to answer any messages I get about the book. This one has much better odds, so if you really want to win, it behooves you go this route. Go to this link and download the Get Wired 5/25 pic and use it as your profile pic on any social network between now and 5/25, let me know about it, and you’re automatically entered to win a free signed copy on the 25th. I noticed the promotional video on your web page, who put that together? My publisher, Variance, was kind enough to whip up that little piece of video magic. The book trailer can also be viewed directly on Youtube, here! Leave a comment, tell us what you think! How did you hear of Variance Publishing? I had participated in Meg author Steve Alten’s Writer’s Coach program starting back in 2004, and so when I finally had my novel ready to submit to publishers in 2008, I asked Steve who he thought might be a good fit and he referred me to Variance. What has it been like to work with Variance? Did they have an extensive editing process? It’s been fantastic working with Variance. As they state on their website, they truly are an author-friendly publishing company. The editing process was indeed extensive, and I’m certain my next work will be even stronger as a result of what I’ve learned from that effort. What was the inspiration for "Wired Kingdom?" From the time I was a little kid I’ve always been a huge fan of television nature shows. By the early 1990’s, wildlife tagging technology had advanced to the point where it was possible to place cameras on the animals and essentially see what they see as they go about their business. One day it just occurred to me as I watched a seal, I think it was, film its own surroundings—‘what if it showed a person being murdered’ --and that little seed of an idea just kind of grew from there for a few years until I decided to write it down. What other stories/novels do you have in development? Don’t be surprised if the protagonist of Wired Kingdom, FBI Special Agent Tara Shores, returns in another thrill-ride of a case in order to solve an intriguing, high-tech mystery. Thanks again for having me, and happy reading! I am definitely going to pick up a copy of Wired Kingdom soon. It sounds like a great read! Thanks a lot, Rai! I hope you enjoy it.